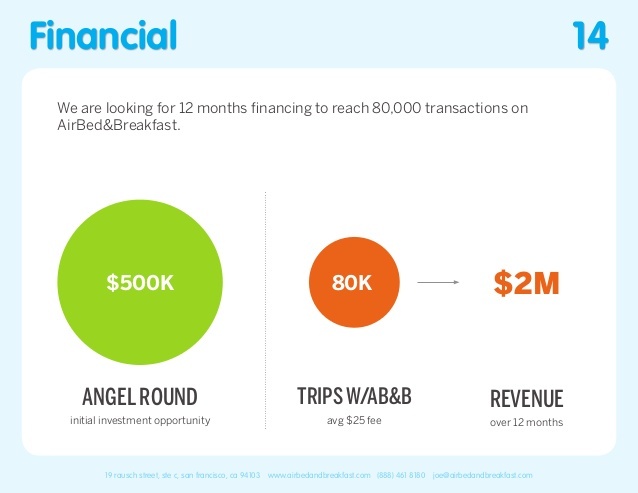 What Do Billion Dollar Pitch Decks Have In Common? Even when you have the right combination of talent and ideas, a small business needs capital if it wants to fully realize its potential. Presenting to investors in person is the best way of getting them to take the leap of faith to give you the funds you need, so you'll want an informative and useful pitch deck to give your presenter all the help that they can get. 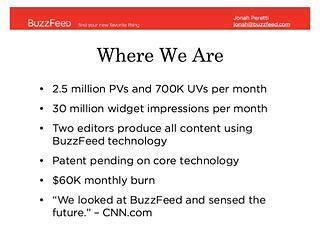 Looking through the pitch decks for successful tech startups, like LinkedIn and BuzzFeed, illuminates the factors that drive investors to commit. Should you run through the epic tale of how your new startup came together or focus on the product? No, but you should at least familiarize the audience with the key figures in your company and what it has already accomplished. 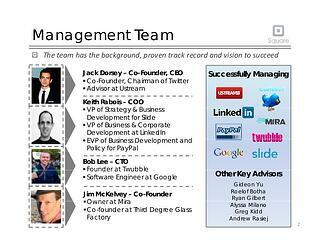 Square gave an overview of their executives and their most notable accounts. Including personal photos alongside the bios is a great feature of this slide that is sorely lacking in some of the other decks. 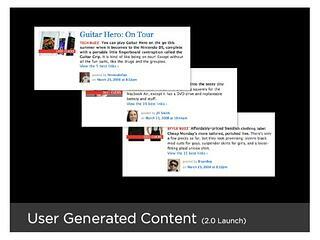 Others put their focus on the product, disconnecting the personal biographies from the company's history. 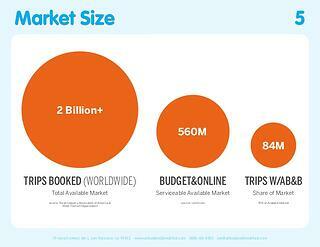 AirBnB's may not look that different from Square's bio section, but it has the most text of any slide in their show. 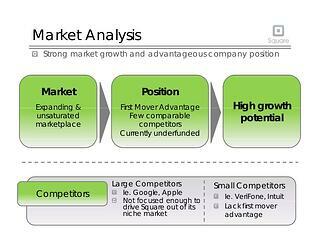 In both major categories, the working strategy is clearly "inform quickly and move on". AirBnB starts highlighting the problem their service solves right out of the gate, setting a narrative of struggle against a terrible, oppressive foe. 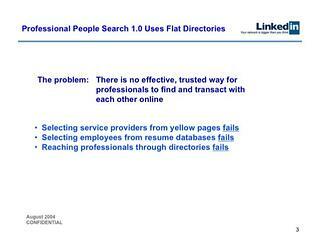 LinkedIn waits one slide, but they go further by highlighting how other solutions fail to address the problem. 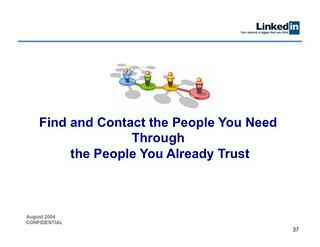 Only LinkedIn can stop the pain of limited professional contacts! It can be a hard sell to convince investors that no one else is attacking the problem, but savvy startups used this to highlight how their product excelled ahead of their competitors and convey a realistic understanding of their market. Most of the pitch decks use a recurring theme and color scheme. 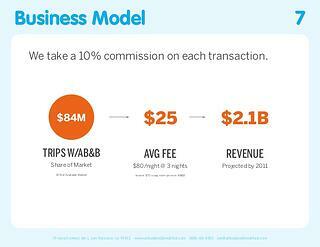 Square makes sure every slide has a noticeable logo in the top right, AirBnB uses a blue and orange theme, while LinkedIn combines the logo and heavy use of blue. Charts and graphs will be your best friend. Every deck is packed with them, with dozens showing up in LinkedIn's. 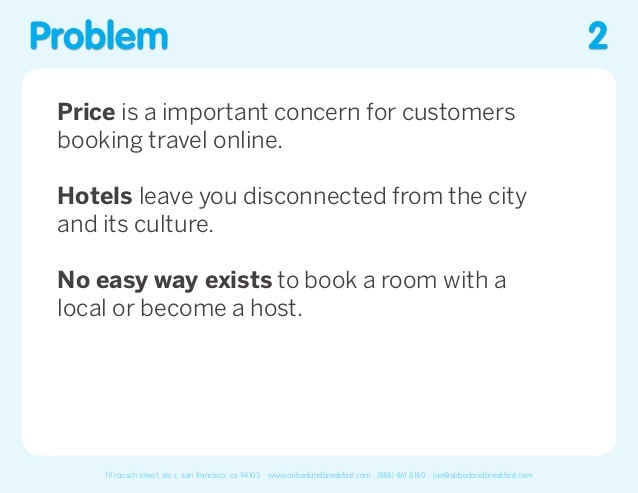 AirBnB's entire slideshow is full of large font sizes, bright colors, and tons of negative space. It's hard to miss anything. When the slide is heavy with text and numbers, Square made it easier to digest by keeping the information condensed into a layout that guides the viewer. When conventional spreadsheets and infographics don't work, format the text by breaking it down into bullets and using colors, bolding, and other formatting methods to keep it palatable. 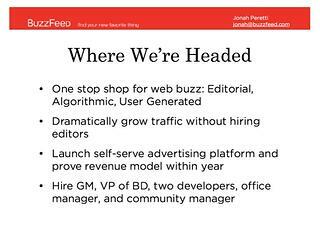 AppNexus does a good job of using the standard title and bullet point format taught on day one of a Powerpoint class, but they variate little and use a color scheme that could put a toddler to sleep. 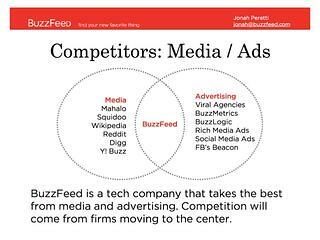 BuzzFeed uses lead-in bullet points supported by labeled images, delivering an effective one-two punch. 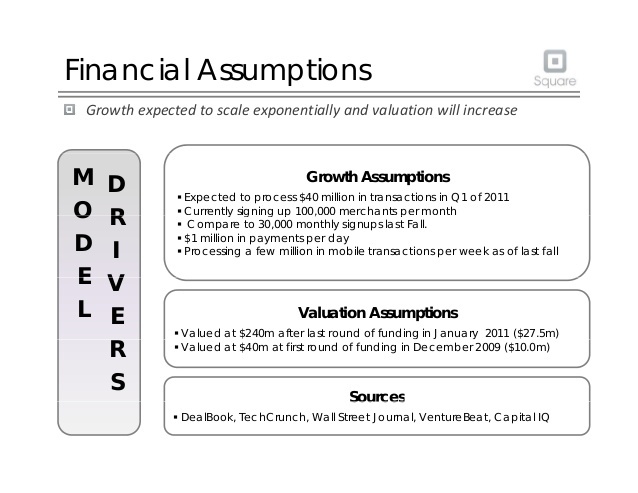 Every deck includes the startup's plan for bringing in revenue. 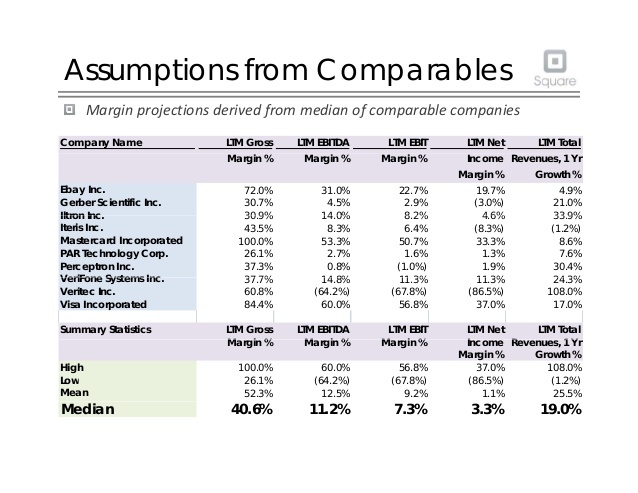 Investors like to know what your current revenue and growth rates look like. Show them what you've done with the tools you have, even if it might appear small compared to the goals of your pitch. 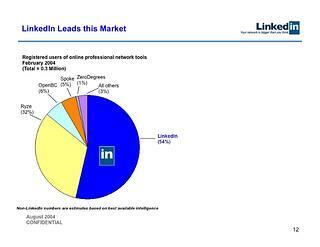 LinkedIn pointed to the total market potential in their financial section, creating a tangible upper bound while invoking the power of seeing dollar amounts in the billions. AirBnB does a splendid job of showing their business model then appealing for investments. 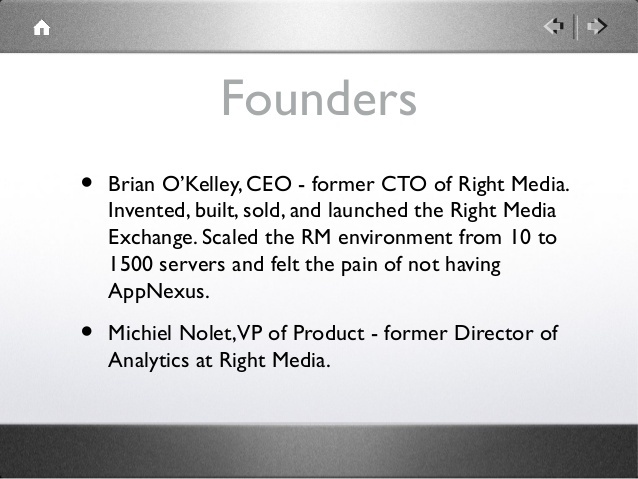 The last slide is memorable by virtue of its position, so how did these business icons spend the valuable resource? 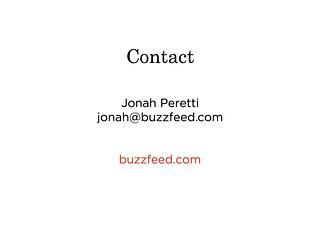 BuzzFeed's is strikingly minimal and focused on follow-up opportunities. 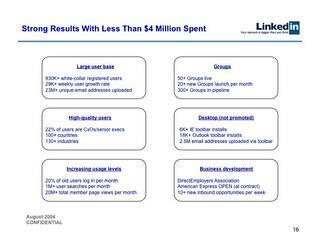 After a long show that was filled to the brim, LinkedIn ends with a prominent image and a company tagline. AirBnB and Square both end with teasers about the RoI, but the former's execution is better thanks to the bright and bold visuals with a real money value for investors to grab. 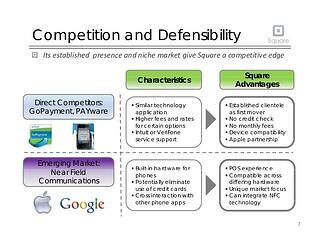 Square's also includes their dig at competitors here, ending on a negative note. 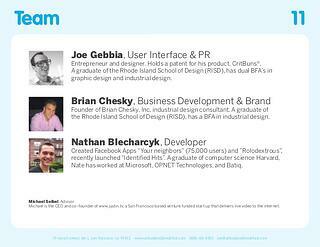 What should your pitch deck look like? Successful decks include powerful imagery and digestible data, establish the company's identity, paint a picture of future growth, and make a call for investments. There is room for improvement in each one, so worry more about hitting the key points and supporting your presenter than fretting over the position of a graph or color of a title.